The Growing Stage’s blockbuster holiday hit from 2012 is back for another holly jolly run, along with my portrayal of the tooth-loving elf, Hermey! The cast is almost the same as last year and I’m so happy to be back with them all again. Some improvement s have been made to the score and some changes have been made to some of the production elements to make this year’s production bigger and better than ever! This year’s run will truly go down in history! Tickets are going fast so hurry to the box office! You won’t want to miss this special holiday event! Please visit www.growingstage.com for tickets and more info! "Step inside our wonder land and be of great, good cheer"
A Very Furry Christmas opens at Sesame Place! Come celebrate the most wonderful time of the year with your favorite Sesame Street friends! Enjoy breath-taking light displays, see one of our three Christmas shows, Elmo's Christmas Wish, A Sesame Street Christmas, and Elmo's World LIVE!- Happy Holidays (directed by ME), and don't forget about our spectacular Neighborhood Street Party Christmas PARADE!! Hop aboard our EXPANDED Christmas Train ride, The Furry Express and tour the Twiddlebug Chocolate Gingerbread Factory. It’s perfect for the whole family and sure to give even the “grouchiest” heart a warm and fuzzy feeling. 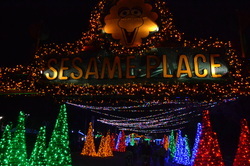 Visit www.sesameplace.com for more information! The day is here! Rudolph Returns!! Rudolph the Red-Nosed Reindeer opens at the Growing Stage! The Misfits are back at the Palace! Back by popular demand, it's the Growing Stage's holiday blockbuster from last year and I will be bringing to life the tooth-loving elf, Hermey again! With some improvements made to the score and changes made to some of the production elements, this production is going to be bigger and better than ever!! "The time has come to have a HAPPY, HAUNTED HALLOWEEN!!" It's that time of year again for the silliest, cutest, and furriest Halloween celebration ever, The Count's Halloween Spooktacular at Sesame Place!! Come "meet me on Sesame Street" for all of the not-too-spooky fun that our adorable theme park has to offer. 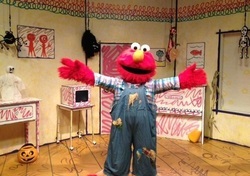 See one of our three spooktastic shows, Countdown to Halloween, The Not-Too-Spooky Howl-O-Ween Radio Show, and Elmo's World LIVE!- Halloween (directed by ME and pictured on the left). Plus, take a walk through one of our three kid friendly mazes, take a ride with one of characters on a hayride, trick or treat through out the park and SO MUCH MORE! This is the perfect Halloween event for families with young kids. Come CELEBRATE Halloween with us! The BCPA opened up a few years ago, right down the street from my house, AND in the studio that was my very first theatre/dance home. As a fundraiser for their wonderful program, for ONE NIGHT ONLY, the BCPA has brought together some of their most talented performers with high quality professional performers from Chicago, New Jersey, New York, and Pennsylvania to bring to life, in concert form, one of the most electric rock scores in musical theatre history! You won't want to miss it! It features one of my best friends, Meredith Beck as Mary Magdalene, an amazing bands, and some spectacualr vocals. I'm so pumped for this Friday! Please visit http://buckscountyschooloftheperformingarts.com/ for tickets and more info! for Heritage Players and the Bucks County School of the Performing Arts!!! I'm so pumped to be involved in this project. The BCPA opened up a few years ago, right down the street from my house, AND in the studio that was my very first theatre/dance home. As a fundraiser for their wonderful program, for ONE NIGHT ONLY, the BCPA has brought together some of their most talented performers with high quality professional performers from Chicago, New Jersey, New York, and Pennsylvania to bring to life, in concert form, one of the most electric rock scores in musical theatre history! You won't want to miss it! My third production with SMT is a musical version of the gold-spinning tale of Rumpelstiltskin. To help tell this story, writers Don Kersey and Steve Leibman employ the use of two spritely kids to act as narrators, Greek chorus, and even some minor characters. I will be playing one of those children! It's a great show for the whole family! I'm having a blast with this cast!! Please visit www.storybookmusical.org for more information! 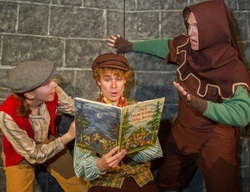 Rumpelstiltskin opens at Storybook Musical Theatre! My third production with Storybook Musical Theatre is a "story all about greed and people who want more than they need." This wonderful, musical version of this classic, gold-spinning fairy tale is told with a slightly gentler touch so that it excites and captivates even the youngest audience member. It's a great show for the whole family! "Tell everyone the party's started!" This summer I return to the SMT stage to help bring to life the classic, straw-into-gold spinning tale of Rumpelstiltskin. To help tell this story, writers Don Kersey and Steve Leibman employ the use of two spritely children to act as narrators, Greek chorus, and even some minor characters in the story. I’ll be playing one of those kids! The show reunites me with my good friend, Rachel Goldberg. 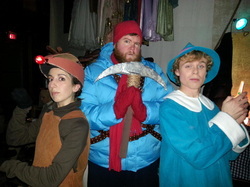 We were last seen together as Hansel and Gretel in 2011. We at SMT have a terrific version of this story to share, containing all of the greed and mystique of the original fairy tale but told with a slightly gentler touch so that it excites and captivates even the youngest audience member. 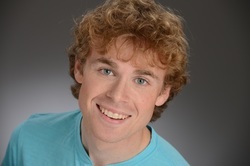 I finally have new headshots! HUZZAH!! I've needed them for about a year or two and I finally had some time (and money) to go and get them. Thanks to my friends at Paul Sirochman Photography for an amazing session! Jenn was amazing with my hair and makeup, she's so chill and extremely talented. She even straightened my curly mop of hair for some of the shots! Check her out at jenniferlynnemakeup.com. As always, Paul Sirochman did an amazing job. His keen, artisitc eye and jolly, laid back personality make his sessions relaxing and fun while producing rewarding, quality photos. He has my highest recommendation, http://sirochmanphoto.com/. Check out some of the shots on my Headshots Page now! The Secret Life of Hubie Hartzel. It's a hilarious story about the perils of life in the fifth grade! Hubie's failing school, stuck with an impossible big sister, his beloved cat is sick, he's targeted bythe school bully, and his only escape are the daydreams that produce his beloved drawings. I'll be playing the role of Frank Vitanza, Hubie's best friend. I can't wait! We'll perform read the play for some students at the Franklin School in Succasunna, New Jersey on Tuesday, March 19. Then, we'll read it for the public on Sunday, March 24th at 1:00pm at the Historic Palace Theatre in Netcong, NJ. Please visit www.growingstage.com for more information! Production photos from With Two Wings, the most recent production I did, have been added to the website! As well as some never before seen photos from Tales of Fourth Grade Nothing!! Visit the Photos Page to check them out!! Winner of TGS's 2011-2012 New Play Reading Series, With Two Wings is the story of Lyf, (played by me), who lives in a world where people are born with wings and the ability to fly, and who lives a hidden existence in the woods with his parents. One day, a pair of twins stumbles upon his isolated hone and suddenly Lyf is confronted with the challenge that comes when one's world is unexpectedly expanded. It's a wonderful story that will leave parents and kids, alike will find relatable and touching. The show runs: February 1 - February 24 at The Historic Palace Theatre in Netcong, NJ. "Schweizer has a delightful stage presence and always makes his character easy to care about..."
talented actor moving with a graceful ease from comic moments to poignant ones and back again." "With two wings and a willingness to try!" With Two Wings opens at The Growing Stage!! I'm so honored to be doing the EAST COAST PREMIERE of the winner of the Growing Stage's 2011-2012 New Play Reading Series! In a world where people are born with wings and the ability to fly, a young boy named Lyf, (played by me), lives a hidden existence in the woods with his parents. One day, a pair of twins stumbles upon the isolated home, and suddenly Lyf is confronted with the challenge that comes when one's world is unexpectedly expanded. It's a beautiful peice of theatre with a message that is terribly important to today's youth. Both children and parents will be touched by with wonderful new play. February 1 - February 24 at The Historic Palace Theatre in Netcong, NJ. The winner of the Growing Stage's 2011-2012 New Play Reading Series, With Two Wings tells the story of Lyf, (played my yours truly), who is born into a world where humans have wings and the ability to fly. HAPPY NEW YEAR EVERYONE! To start off 2013, I added some wonderful production photos from my most recent show, Rudolph the Red-Nosed Reindeer! All photo credits go to the Growing Stage. Please check them out by visiting the Rudolph Photos page! Or 2012 ... or even 2011!